Saint Padre Pio Relics to be presented in La Crosse. You don’t have to appreciate sports memorabilia to have a nose for these answers, for most (if not all) of us have some attachments to special items from our family’s history: mother’s silver, baby’s first lock of hair, a loved one’s letters. The Catholic Church calls these memorabilia relics — and the Catholic Church in La Crosse is blessed to be hosting many of the relics of Padre Pio (St. Pio of Pietrelcina)on Sept. 20 at the Cathedral of St. Joseph the Workman. There have been those outside and — sadly enough — inside the church who have criticized this particular form of veneration as backwards, medieval or just plain morbid. Yet, apart from the natural connection that we have for those precious possessions of our loved ones, there is a supernatural association that moves us to venerate a saint’s relics. The saints were like us in so many ways — bodies and souls, virtues and vices, recipients of grace and susceptible to sin. But from these natural capacities common to us all, the saints became superstars of spiritual life — a sort-of spiritually heroic “Tom Brady” (if a Wisconsinite will forgive the analogy) of life’s grand competition. (2 Tm 4:7) Padre Pio, for example, is an example of spiritual and human excellence, an MVP of this world’s greatest endeavor. These same saints assist us today. Not only are they examples to imitate, but they are also powerful intercessors in helping us “run the race.” Thankfully, the church provides a tangible means for us to stay in contact with these heroes of grace: their relics. While New England’s fans may feel blessed to own Tom Brady’s #12 jersey, we are blessed to have a number of relics from St. Padre Pio, including one of his own shirts with the blood of the stigmata, a lock of his hair, his Franciscan habit and one of his Mass vestments. But these items are not magical. Rather, they are human and holy reminders of this most valuable brother, our example and intercessor, and an occasion for us to receive the grace by which Christ conforms us to Himself and thereby prepares us to be received by His Father in heaven. 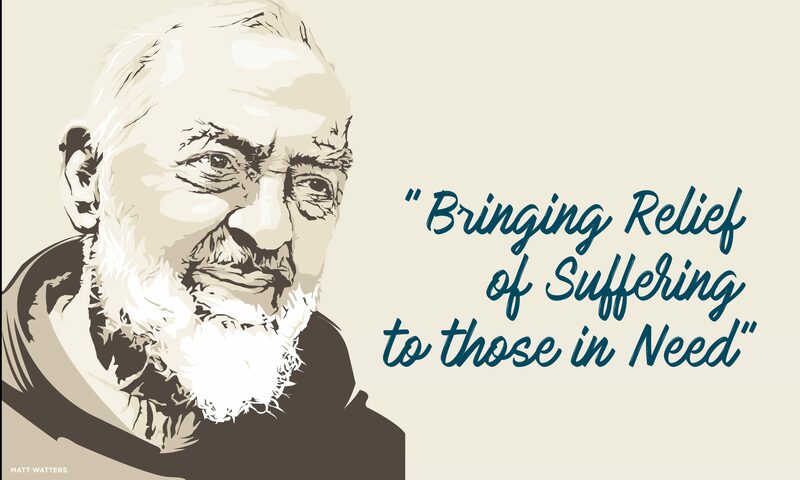 SEPTEMBER 20, 2017 | 9 A.M. – 7 P.M.
anniversary of Saint Padre Pio’s birth, and the 15th anniversary of his canonization. Veneration of the relics will be offered from 9 a.m. – 11:45 a.m. and 1:15 p.m. – 6:30 p.m. Mass will be offered at 12:10 and at 7 p.m. The 7 p.m. Mass will be a Mass in honor of Saint Padre Pio celebrated by the Most Reverend William Patrick Callahan. FOR MORE INFORMATION about the public veneration, visit diolc.org/relics, call 608-788-7700, or send an email to relics@diolc.org.